Luxury, modern townhomes have become very popular throughout the Greater Toronto Area (GTA). 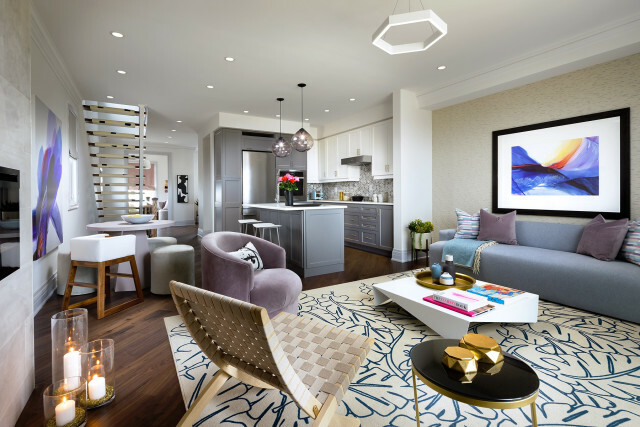 It started off with townhomes being an affordable alternative to the increasingly expensive detached home lifestyle, but now townhomes are also a way of affording luxurious upgrades! Chelsea Maple Station in Vaughan by Aspen Ridge Homes is a perfect example of high-end townhome living. There are currently four 18’ model modern townhomes at Chelsea Maple Station where you can experience the standard features and finishes, as well as upgrades that Aspen Ridge has to offer. 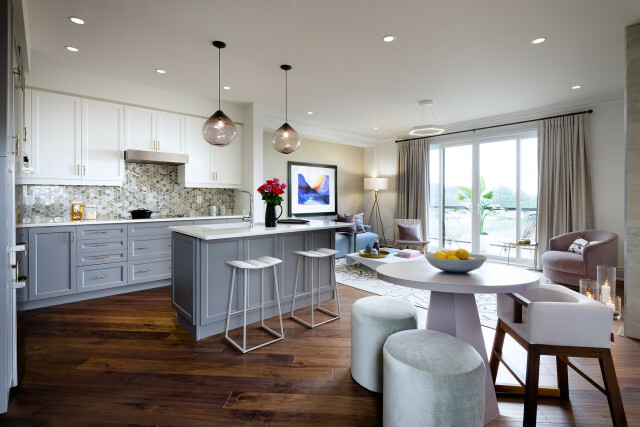 One of the model homes was recently fully decorated by interior designer Sabrina Albanese, who aimed for and accomplished a comfortable yet sophisticated look and feel throughout the home. In addition to the “man-cave,” there is what Albanese calls a “chick-cave,” which is the den on the next level of the home that showcases a palette of mauves and whites. Moving into the living room, there are many classic pieces with a Scandinavian flair, as well as an area rug designed specially by Albanese to match the sofa and arm chair. The open staircase gives the layout a light, airy feeling and Albanese emphasizes this brightness with soft materials, grays and blues, natural elements like wood and stone, and minimal metallic accents. Albanese takes advantage of the two-tone trend in the kitchen, with the lower cabinets featuring a light grayish blue tone, and the upper cabinets are white, which creates a sense of space as the natural light from the large windows in the living room bounces off of them. Another trend that has become very popular in DIY home decor is the use of any other material for a headboard other than a headboard. In the master-bedroom, Albanese uses wallpaper resembling marble tile as a feature behind the bed instead of a traditional headboard, which will definitely stand out when you go and tour the home. 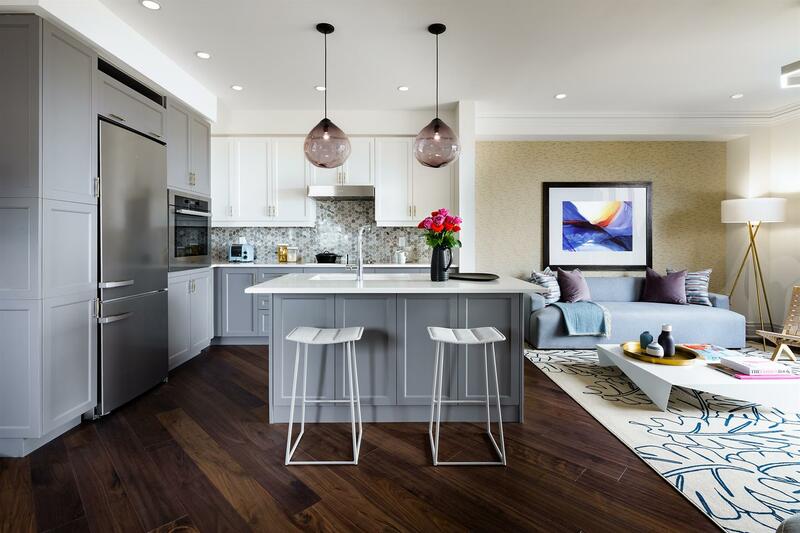 Other interior features and finishes that come standard at Chelsea Maple Station include 9’ ceilings, stained oak veneer stairs, pickets, and rails, ceramic and/or porcelain tile (resembling marble), pre-finished stained oak engineered flooring, and granite or quartz countertops. Many of these would be upgrades at other communities! The available townhomes at Chelsea Maple Station range from 1,875 to 2,378 square feet and prices start at $724,990. If you shopped around for a detached home near Maple GO Station along Major Mackenzie Drive, or anywhere in the GTA for that matter, with these incredible finishes and spacious layouts, you’d end up paying at least in the $900,000s, if not over $1 million. That’s why Chelsea Maple Station is the perfect option for the homebuyer who wants a luxurious modern home, but doesn’t need the space offered by a detached home! For more information, visit the presentation centre at 18 Hill Street on the northeast corner of Major Mackenzie and Keele. The hours of operation are Monday to Thursday from 1 pm to 8pm and on weekends and holidays from 11 am to 6 pm. You can also call 289-553-3147 for additional details.